There are few works in existence that teach gospel singing and even fewer that focus on what gospel soloists need to know. In So You Want to Sing Gospel, Trineice Robinson-Martin offers the first resource to help individual gospel singers at all levels make the most of their primary instrument—their voice. 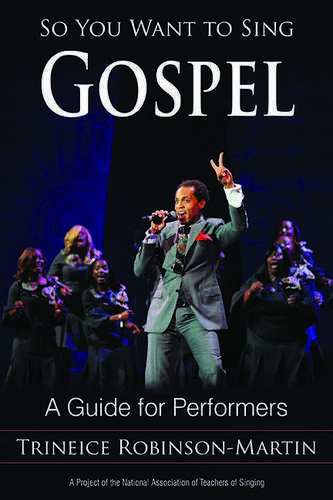 Robinson-Martin gathers together key information on gospel music history, vocal pedagogy, musical style and performance, and its place in music ministry. So You Want to Sing Gospel covers such vital matters as historical, cultural and spiritual perspectives on the gospel music tradition, training one's voice, understanding the dynamic of sound production, grasping gospel style, and bringing together vocal performance with ministerial imperatives. She also includes in her discussion such matters as voice type, repertoire selection, and gospel sub-genres. Additional chapters by Scott McCoy and Wendy LeBorgne, and Matthew Edwards address universal questions of voice science and pedagogy, vocal health, and audio enhancement technology. The So You Want to Sing series is produced in partnership with the National Association of Teachers of Singing. Like all books in the series, So You Want to Sing Gospel features online supplemental material on the NATS website. Please visit www.nats.org to access style-specific exercises, audio and video files, and additional resources. Trineice Robinson-Martin holds a doctorate of education and specializes in contemporary commercial music voice pedagogy. She is the creator of Soul Ingredients®, a teaching method for developing a singer’s musical abilities in African American folk based music styles such as jazz, gospel, R&B, and blues. She currently teaches private voice lessons and directs the Jazz Vocal Collective Ensemble at Princeton University; teaches private voice lessons at Rider University; serves on the national faculty of the Gospel Music Workshop of America, Inc.; and is the Executive Director of the African American Jazz Caucus, Inc.